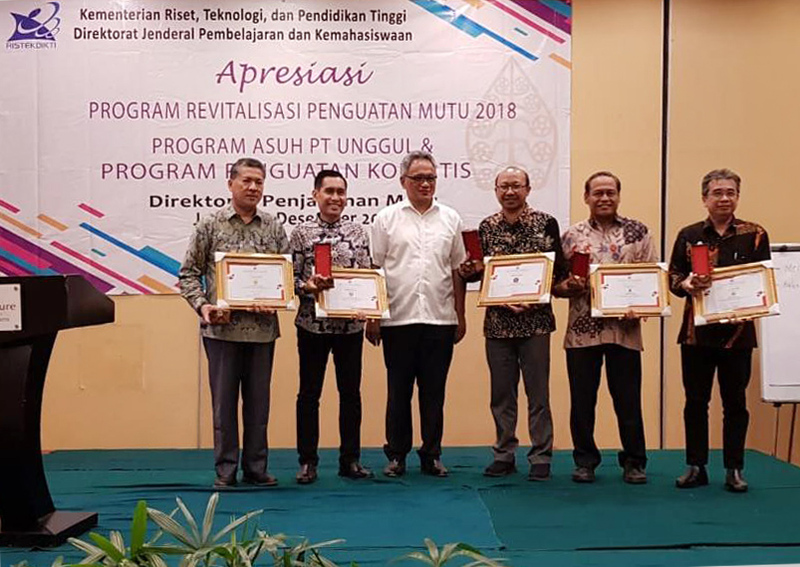 Syiah Kuala University (Unsyiah) won an appreciation for the PT Asuh Program from the Ministry of Research, Technology and Higher Education (Kemenristekdikti). This award was presented in Jakarta on Wednesday (12/5) which was received directly by Prof. Dr. Marwan, M.Eng as Vise Rector of the Unsyiah Academic Field. Unsyiah was considered successful in running the Grant Program PT Asuh in providing guidance and helping to improve the quality of undeveloped universities in Indonesia. This assessment is seen from the efforts of Unsyiah which helps increase the value of accreditation of institutions and study programs for the tertiary institutions they develop. In addition, it also helps improve the implementation of internal and external quality assurance systems. Chairperson of PT Asuh Unsyiah's Implementation Team, Dr. Ir. M. Aman Yaman, M. Agric. Sc., Friday (12/7), said that this success was inseparable from the Internal Quality Assurance System (SPMI) that Unsyiah had implemented and developed so far. This model is a best practice given by Unsyiah based on its experience in improving quality, achieving A accreditation, and entering the ranks of the best national universities. "This program is very much needed by private universities that need support in improving academic quality, service quality, and accreditation of study programs or institutions," he said. In this year's PT Asuh Program, Unsyiah fosters 21 study programs in five private universities in Aceh. The five PTS are Iskandar Muda University, Academic Management of Computer Science-AMIKI (Banda Aceh), Gajah Putih University (Takengon), STKIP Bina Bangsa Meulaboh, and National STIE-Lhoksemawe. Aman added that this achievement was the second time achieved by Unsyiah. Previously in 2017, Unsyiah also received the same award because it had succeeded in fostering two universities, namely Jabal Ghafur University (Sigli) and Serambi Mekkah University (Banda Aceh). He hopes that this program can make higher education institutions more independent and able to create a quality culture, so as to improve the quality of education.